Description: The narrow sawfish has a slender body. It has smooth skin that goes slimy after the animal dies. They are green grey coloured when looked at from above and pale white underneath. The first dorsal fin is behind the pelvic fin origin and there is a deep fork in the caudal fin. 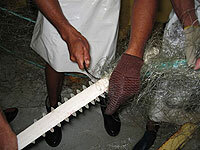 The rostrum teeth do not extend onto the base of the saw; and the rostrum does not taper from one end to the other like rostrums of freshwater and dwarf sawfishes. Where they are found : Most widely distributed and abundant sawfish in Queensland waters. They are also found in the Northern Territory and Western Australia. The species prefers inshore coastal mud and sand foreshores and bays mostly in its juvenile life stages. Large mature animals are commonly found in offshore waters to a depth of 40m. The species is very rarely encountered upstream of river mouths in estuarine water. Narrow sawfish are commonly caught in trawling nets whilst the sawfish chase small fish and squid. 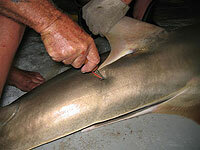 A Gulf of Carpentaria (GoC) commercial shark fisher placing a pit tag into a mature narrow sawfish. Note the shiny complexion of the skin and how smooth it is. Size: Narrow sawfish can grow to a maximum size of 470 cm. Diet: They eat prawns, squid and fish. Utilisation: Meat and fins; rostrum trophy collectors. before the animal was tagged and released alive.